This finger-lickin’ vegan, egg-free, dairy-free and nut-free recipe Vegan Kale Mushroom Bruschetta will be loved by vegans and non-vegans alike, and enjoyed by all ages! Not only is the kale mushroom topping quick to put together with under ten ingredients, the topping can also be made the day before so that you can whip up the hot toasty bruschetta easily on the day of serving. Sprinkle on some vegan cheese shreds before baking or leave them out of the recipe – this bruschetta will still be delicious! Serve this easy finger-lickin’ vegan, egg-free, dairy-free and nut-free plant-based dish as an appetizer for a party function or as a tasty side to go along with a main course, soup or salad. Preheat the oven to 375 F (or 191 C). Wash and dice up the kale leaves (remove the leaves from the thick stems first). Wash and finely dice the mushrooms then mince the garlic cloves. Heat up a tablespoon of oil in a skillet on medium heat, then add the minced garlic and sauté for 2-3 minutes or until golden. Add the diced mushrooms, ground thyme and balsamic vinegar into the skillet. Sauté these together for at least 3 minutes or until most of the cooking liquid in the skillet has evaporated. Meanwhile, slice up the baguette bread into ½ inch thick oval rounds and place these on a parchment paper lined baking sheet. Add the diced kale and remaining seasonings (salt and garlic powder) into the skillet. Continue to sauté the skillet contents for 3-4 minutes until the diced kale and mushrooms are cooked through completely. Remove this kale mushroom mixture from the skillet, and spread by tablespoonfuls onto the oval bread rounds on the baking sheet. Sprinkle on some vegan cheese shreds on top of each bread slice (optional). Bake in the middle rack of the oven for 10 minutes (check to make sure the vegan cheese shreds do not get burnt on top). Remove from the oven, let cool slightly then serve! As stated earlier, you can omit the vegan cheese shreds and it will still taste delicious! If you don’t have balsamic vinegar, you can substitute with an equivalent amount of soy sauce (or tamari sauce for a gluten-free version). Feel free to prepare double or triple the amount of kale mushroom topping depending on the number of guests you plan to have at your party. 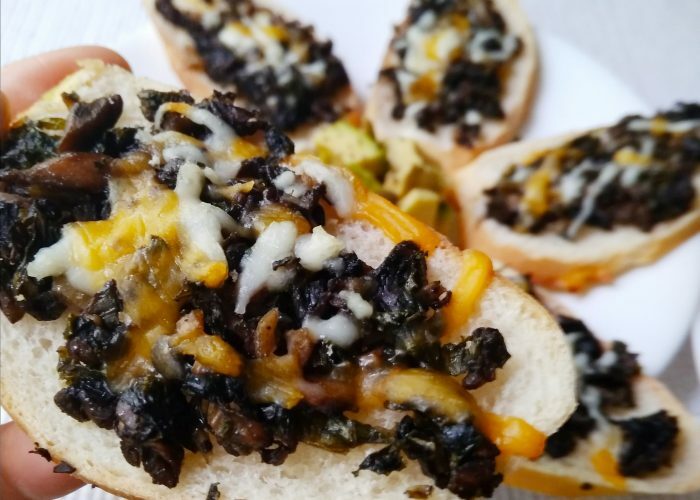 I actually made this Vegan Kale Mushroom Bruschetta as an appetizer dish this past weekend for our own holiday party, and it was enjoyed by all present (even the little ones). I simply prepared the topping the night before, and then on the day of the gathering, just took a few minutes to slice the bread, spread them on the baking pan and layer them with the topping before toasting the slices in the oven for 10 minutes. Voila, done. This gave me all the more time to spend actually catching up and enjoying my guests. Wishing you all a wonderful holiday season!